One loves cats and is a self-proclaimed “crazy cat lady”. One loves elderly pugs and collects them like trading cards (all jokes aside, she fosters many dogs and it’s a truly wonderful thing that I wish I could do). Another adores all animals – so much so that she visits animal sanctuaries and sponsors pigs. Sometimes their name is Eric, because, you know… pigs are named Eric and not Babe. One loves kitchen gadgets (clearly I’m on her wavelength about this one). Dual-purpose gadgets are her bread and butter. One recently got his black belt after years of hard work, and loves all things ninjaesque. That’s a small sampling, but you get the idea. The reason I bring this up is because I haven’t found that thing that gets me super excited in life. Don’t get me wrong – it’s not like there’s nothing that makes me happy. Lobster, ice cream, puppies, sea otters… I love those things. They make me happy. But I wouldn’t say I’m passionate about them. I would say the closest thing would be the feeling I get when I’m tinkering around in the kitchen trying to piece together a recipe. It’s probably not passion, but it is definitely satisfying to come up with a delicious final product that I want to share with you all. Enter LU Petit Écoliers. A couple weeks ago we had a birthday celebration in the office and on the table there were a couple boxes of of Petit Écoliers. Two of my coworkers lost their minds over it. They were like kids on Christmas morning they were so excited! They started telling me how it reminded them of their childhood and how much they loved those little cookies. I mean, I like them and all, but I’ve never gone bonkers over them. I kept thinking about them and decided that I should try to make them homemade. I bought a box of them and got to work trying to dissect the ingredients and get it right. It took me quite a few batches to get the right balance of salty and sweet. And truth be told, I still think they ended up being just a little saltier than I would like. And while these aren’t exactly the same, the feedback I got from those same two coworkers was that these are better than the boxed kind. And that they liked that the buttery biscuit layer was saltier. I’ll take it. 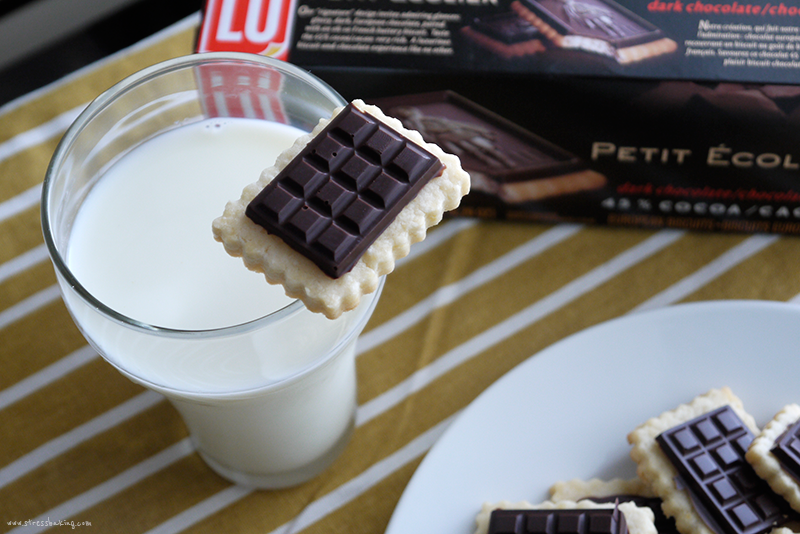 I’ve decided that paring these with a glass of milk, as cliche as it is, is perfect. 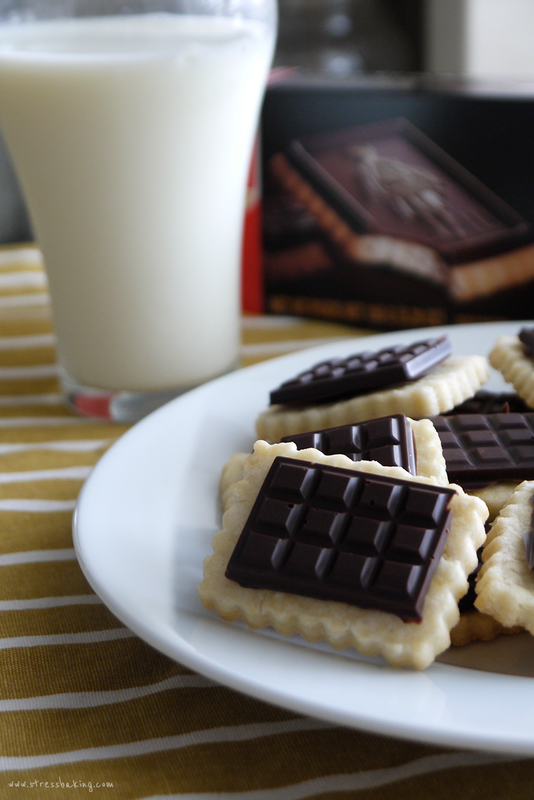 It only takes one or two bites to finish the cookie, and then you can wash it down with some nice cold, creamy milk. Mmmm. There’s just enough sweetness to satisfy a chocolate craving, but also enough saltiness to kill off the urge you might have to grab a bag of chips. And trust me on this one – grab these, not chips. These would also make adorable holiday gifts. Wrap them up in little gift bags or boxes and give your friends and family a little lovin’ from your oven. It’ll definitely beat a fruitcake – trust me. 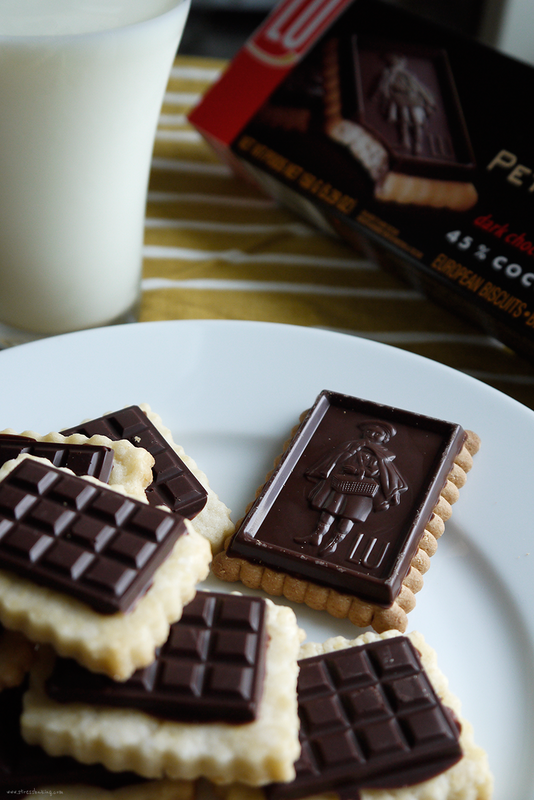 Decadent dark chocolate is paired with a buttery French biscuit for a sweet bite-sized treat. In a medium bowl, mix together egg, flour, sugar, vanilla and salt with a wooden spoon. Cut in the cold butter with a pastry blender (or a fork – that’ll just take longer). I can’t emphasize enough that the butter needs to be cold – even frozen will work. As this point, you’ll probably need to use your hands to combine all the ingredients – if the butter starts to get melty due to the warmth of your hands, place the bowl in the fridge for a little bit until it firms up again. Turn the dough out on a flat surface covered in wax paper. Set another piece of wax paper on top and use a rolling pin to flatten the dough to around 1/2 cm. Place flattened dough in the freezer for an hour. While the dough is chilling, prepare the chocolate tablets. Place chocolate in a microwave-safe bowl, stirring every 15 seconds or so until melted and smooth. Pour melted chocolate into mold and place the mold in the fridge for an hour. 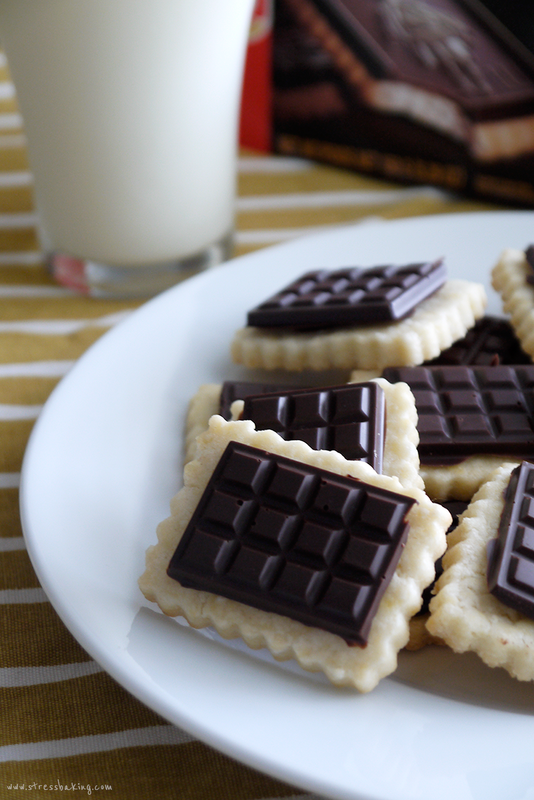 Remove dough from freezer and use a rectangle cookie cutter to cut out each of the biscuits. Place them back in the freezer for another 15-20 minutes and start preheating the oven to 350º F.
Place biscuits on a baking sheet prepared with a silicon baking mat and bake for 10-15 minutes, or until the edges are slightly browned. Let cool on baking sheet for 5 minutes, then move to cooling rack to cool completely. 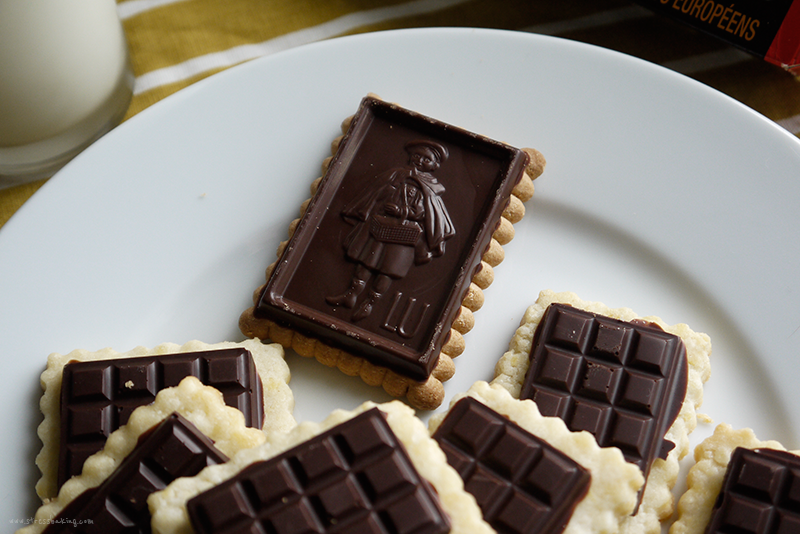 When biscuits are completely cooled, remove each of the chocolate tablets from the mold. 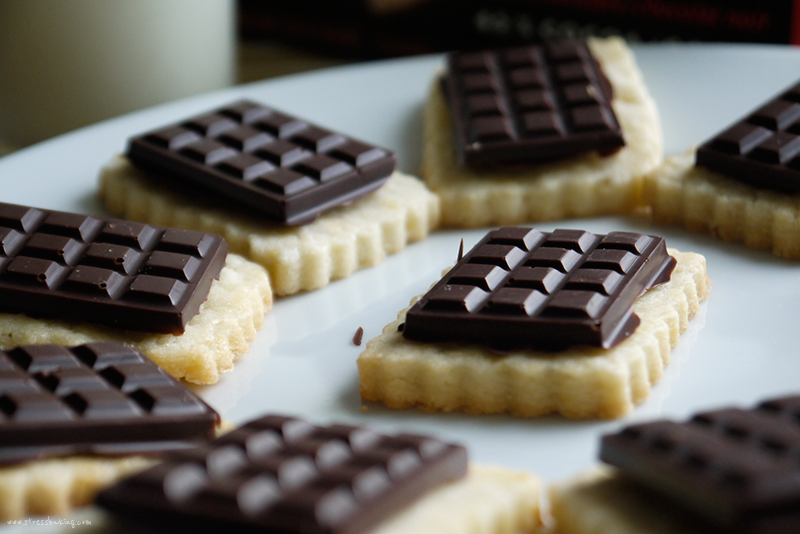 Melt a little bit more dark chocolate and add a couple drops to the center of each biscuit, then place a chocolate tablet on top. Store in an airtight container, preferably in the fridge to prevent the chocolate from melting. Enjoy!